There is no mistaking that technology has changed the world for the better. Thanks to technology both businesses and consumers are presented with new and exciting products as well as new marketing strategies. One technology that is changing the playing field for businesses is drones. Unmanned aerial vehicles (UAV) also known as drones can allow an old business to completely reinvent itself and even present new opportunities that won’t be found elsewhere. In 2016 the Federal Aviation Administration (FAA) released drone laws (Read more here) that clarified the legal landscape for drone usage for work and business. However, as time has passed the agency has relaxed some of the initial restrictions that required permits and imposed restrictions. For instance, it is no longer considered illegal to fly a beyond-line-of-sight drone. These new regulations even allow for nighttime flying. Since the release of these rules in 2016, the market has really taken off and businesses from all around the world have been taking advantage of these innovative and unique drones. So, how can drones be used commercially? Listing agents of commercial and residential property can greatly take advantage of drones. They can use their vehicles to create beautiful video tours of their properties and post them on their website. These vehicles also make it entirely possible to show off parts of the property that might not be accessible by foot during the initial showing. These vehicles can also come in handy when realtors are trying to show off properties with lots of lands. Land that would not be able to be covered during the initial walkthrough can be captured by drone and sent to the potential buyer. 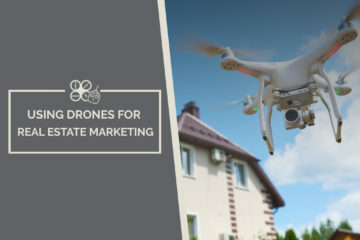 Realtors could even have the drone on sight when the potential buyer arrives for the showing and they could present the property live. Couples have been trying to come up with unique ways to capture their special day for years now. Some couples like to record their experience, some couples like to hire a professional photographer, some couples might even invest in a photo booth, and some couples are now taking advantage of drone technology. Some professional wedding photographers are now offering drone footage of the wedding. These unique vehicles really allow the photographer to capture the wedding from an entirely different view. These vehicles are extremely popular for outdoor weddings. Any wedding photographer looking to use drones to record weddings should keep in mind that drones can be somewhat noisy. You want to make sure that you are using models like DJI Mavic Pro Platinum because they don’t produce as much noise as other models. There really are a number of ways that farmers can benefit from drone usage. In fact, the agriculture industry provides an enormous opportunity for drone technology. This type of technology will not only help farmers identify failing plants early on, but it can help make keeping track of inventory easier. However, the biggest advantage of drone technology in the agriculture industry is that these vehicles all farmers to map and study the farmland as well as the irrigation systems. In all of the above-mentioned situations, drone technology would greatly expedite what would otherwise be time-consuming projects. However, these are not the only uses for drones in the agriculture industry. Drones can also be utilized to spray pesticides, fertilizers, or even water crops. Each unmanned vehicle can act like a cheaper mini-crop duster. Drone technology can even help farmers keep an eye on their livestock by monitoring their health and keeping track of the population. Drone technology has the potential to propel the art of photography and videography to new heights. The possibilities really are unlimited for the photography industry. Just remember when times were much simpler and all you needed was a camera and roll of film to capture stunning images? Well, that is no longer the case and any photography business looking to take their business to the next level should consider drone technology. Drones like the DJI Inspire 2 can really give you photos unique and interesting perspectives. And, this is because drones like the DJI Inspire 2 are equipped with built-in cameras that can rotate and swivel. This gives the photographer the ability to shoot photos and videos from a variety of angles. The most exciting thing about drone technology in the photography industry is that they allow photographers to really take advantage of action shots. Before drone technology, if you wanted to capture live action this process would require an expensive helicopter or a cable-suspended camera system. That is no longer the case with drone technology. This technology really allows photographers to get right there beside the action and capture it. Any photography business looking to use drones in this manner should consider drone flight time of the drone that they are investing in. You wouldn’t want your drone to give out right in the middle of the action. Construction contractors like real estate agents can greatly benefit from drone technology. This technology will give any construction contractor the ability to use images and footage captured from the drone to create blueprints or 3D renderings of the structure that is going to be built. And, the best part is that you can do this cheaply and quickly with the aid of drones. Drones might reveal threats and potential downfalls with the property or structure that would not otherwise be seen by the naked eye. The ability to view a site or structure like this really is indispensable when it comes to creating accurate designs and understandings of how the structure will fit within the outlying perimeters. While there are many drones to choose from, I would recommend the Autel Evo for projects like this. This is one drone that has excellent control range and which I have personally purchased and reviewed. Drone-based delivery services probably are one of the most obvious commercial uses for drones. However, drones are still pretty restricted when it comes to load-bearing weight. In fact, even impressive drones like the DJI Mavic 2 Pro can only hold a maximum of 55 pounds including the weight of the drone itself. It is safe to say as time goes on and technology begins to expand it will be a real possibility for delivery businesses to make money using drones. They will be extremely handy when weather conditions are bad and in situations where the roads are treacherous. Drones could be immensely handy in the emergency industry. This is especially true when it comes to delivering medical supplies to a stranded victim or getting eyes on a difficult situation. This type of technology would greatly enhance the ability of emergency response physicians to offer care in many difficult situations. Drone technology could even be utilized to search for victims that have gone missing in the woods or desert. Drones are expensive and they can be even more complicated. This is especially true for the novice user that has absolutely no experience whatsoever with drones. No one wants to run out and buy an expensive tool only to crash it and destroy it the same day. This is why drone training will become more popular on a commercial level. Business owners that are going to take advantage of drones will want all their employees educated and trained on all thing drones. There are already a number of companies out there that are training and educating people on drones. And, as the technology grows more and more popular there will be a greater need for drone training. Drones like the Yuneec Typhoon H are excellent to learn on because they are somewhat simpler but included more than the essential features. Anyone looking to use drone technology in this manner should also study up on the FAA regulations so that they can educate their classes on the local regulations and restrictions for commercial drone flying. Drones can also be invaluable to the media industry. There was a time when aerial shots were only available to the large new corporations that could afford news helicopters. Thanks to drone technology that is no longer the case and now local journalists and small-scale media outlets can easily capture aerial footage for their new programs. However, what’s even more impressive is the fact that drones can get into tighter spaces and lower to the ground than a new helicopter ever could. This would make recording a face-to-face interview more dynamic and engaging with a camera-equipped drone flying overhead. Engineering firms that take on projects like road construction and maintenance, airport planning, and infrastructure projects will find drone technology extremely handy. These types of firms can use drones to survey the area where the work is going to be performed. The use of drones and sensors will greatly expedite this type of work in significant ways. Not only will the firm be able to survey the entirety of the area quickly, but they will be able to reach tough spots that might not otherwise be accessible by vehicle. thedronelogic.com is a participant in the Amazon Services LLC Associates Program, an affiliate advertising program designed to provide a means for sites to earn advertising fees by advertising and linking to amazon.com.